In addition to building fine custom homes and properties, Hacking Construction is unique in that it also offers landscaping services to its customers. A house truly isn't a home until it is beautifully landscaped by a team of experienced professionals. Many customers find it very natural and convenient to trust the same company who they have worked so closely with during the construction process for their landscaping needs, thus completely seeing the construction process through from beginning to end. 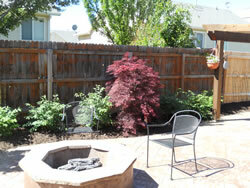 A homeowner's yard is an extension of their home, needing the same care taken in its design as that of the home. Our sister company, Vision Landscaping, is an extension of Hacking Construction. This enables us to more fully aid our customers in every facet of their building needs, both inside and out. In addition to the landscaping photos included here, please feel free to visit www.myvisionlandscaping.com for more information on our landscaping services.